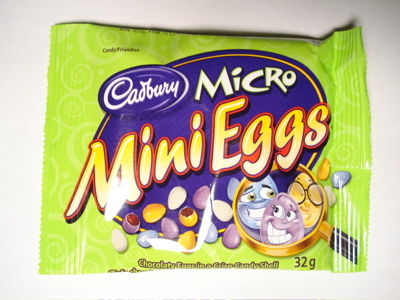 Cadbury Executive 1: Yeah, Mini Eggs are pretty darn popular. Cadbury Executive 2: No kidding â€“ theyâ€™re our top-selling Easter candy. But you know whatâ€™s wrong with them? Cadbury Executive 1: No, Bob â€“ whatâ€™s wrong with them? Cadbury Executive 2: Theyâ€™re just not MINI enough! Cadbury Executive 1: By Georgeâ€¦ I think youâ€™re on to something! And thus, Micro Mini Eggs were born. Unsurprisingly, they look just like mini versions of the regular ones, with their pale pastel colors speckled with brown. 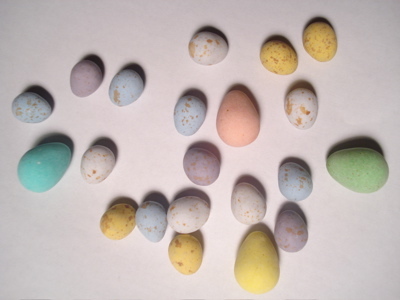 (In the picture below, the bigger eggs are regular-sized Popping Eggs.) However, they do only come in four colors â€“ purple, yellow, blue and white. If you want to believe the bag, Purple is the chick, Blueâ€™s the cool dude, and Yellowâ€™s a dead ringer for my Aunt Marge. Maybe White’s the pasty nerd who never leaves his basement, thus explaining why he didn’t show up for the photo shoot. But after eating one of these right after eating a Popping Mini Egg, something about it seemed… off. While the Popping Mini Eggs displayed that distinctive Mini Egg flavor that everyone knows and loves, the Micros just tasted… different. Was it just the non-standard ratio of candy coating to chocolate? Or was it… something else? A quick check of the ingredient list confirmed my suspicions â€“ while the Popping Eggs proudly display milk chocolate as the first ingredient, the Micros contain sugar, cocoa butter and milk ingredients â€“ but also an assortment of suspicious vegetable fats, making them, if not totally mockolate, then definitely heading down those lines. The new chocolate combines with the vanilla flavor of the shell for a taste that, well, doesnâ€™t taste like Mini Eggs. Itâ€™s definitely missing that distinctive milky tang thatâ€™s common to most of the chocolate bars Cadbury makes. Actually, they really remind me of Smarties (the chocolate version, not the powdery version, for you Americans), and while thereâ€™s nothing really wrong with the way Smarties taste, theyâ€™re just not Mini Eggs, damn it! You canâ€™t really blame Cadbury for trying to cut costs in the current economy â€“ but reducing the package size and cutting corners on the chocolate? Thatâ€™s cold, Cadbury. Cold. I really hope this isnâ€™t a taste of things to come â€“ if this mockolate special edition sells, I wouldnâ€™t put it past Cadbury to do a Hersheyâ€™s and start implementing the same changes to their regular lineup of Mini Eggs â€“ thus ruining what is, for many people, the best part of Easter.